Experience the magical beauty of one of the most exceptional flowers that could ever grace your garden. A recent introduction and already an award winner, Passiflora ‘Snow Queen’ is proving to be a very desirable addition to UK gardens. Bigger and better that the old favourite ‘Constance Eliott’ its spectacular, pure white flowers are a sight to behold, with a centre filled with striking, feathery stamens. Perfect to grow over an obelisk, up a trellis or over a fence 'Snow Queen' has a compact habit which means that it can even be grown in a pot on the patio or on a balcony - so anyone can grow this stunning climber. Easy to grow and an absolute 'must-have' for your garden, Snow Queen is totally winter hardy to -8°C and its glossy, lobed leaves are evergreen to semi evergreen. Supplied as an established plant in a 9cm pot ready for immediate planting, this passion flower will grow to 3m (10ft). A recent introduction and already an award winner, Passiflora ‘Snow Queen’ has picked up prizes at both the Plantarium Trade Fair and the HTA National Plant Show and is proving to be a very desirable addition to the garden. Bigger and better that the old favourite ‘Constance Eliott’ its spectacular, pure white flowers are a sight to behold. With a centre filled with striking, feathery stamens the blooms that are almost twice as large and remain open for two to three days. An absolute 'must-have' for your garden, Snow Queen is totally winter hardy to -8°C and its glossy, lobed leaves are evergreen to semi evergreen depending on temperature. It's so easy to care for, this vigorous climber will flourish in a dry sunny location with free draining soil. Mulch plants deeply to help protect the roots over winter. Should frost damage the vines, new ones will be produced from below ground. 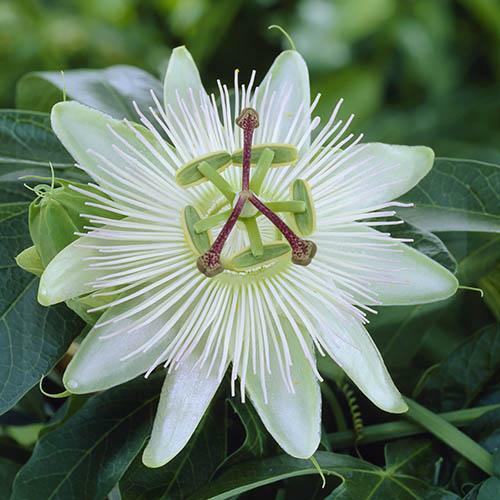 Passion flowers tends to bloom particularly well when their roots are restricted by a container or path side border. When planting in a container, use John Innes No 3 potting compost, or any good quality compost. Pot-grown shrubs can be planted at any time of the year as long as the soil is not waterlogged or frozen. Water your potted plant well, then dig a hole a little deeper and 3 x wider than the nursery pot. Water 'Snow Queen' well and regularly for the first few months. With a robust and rapidly growing root system, your plant will establish rapidly. Once planted, keep the area free of competing weeds. Apply a generous layer of mulch around the base of the plant after planting and thereafter annually. Little pruning is needed apart from removing any branches that are dead, damaged or diseased. If your passion flower is overgrown or badly frost-damaged, carry out renovation in spring by cutting back the stems to 30-60cm (1-2ft) from soil level and Snow Queen will respond by sending out new shoots.